On August 2, the Committee on Space Research (COSPAR) Council Meeting was held at the Lomonosov Moscow State University, Russia. 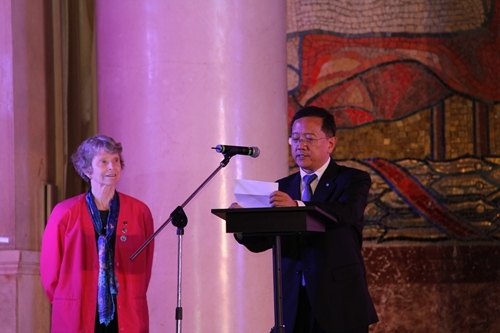 Prof. WU Ji, Director General of the National Space Science Center (NSSC), was elected for the second term as the COSPAR Vice President, tenable from 2014 to 2018. Prof. LI Lei, from NSSC was elected as the member of the COSPAR Nomination Committee tenable from 2014 to 2018. The Nomination Committee is composed of 5 distinguished space scientists from the world space science community. COSPAR was established in 1958 as an interdisciplinary scientific body concerned with the progress on an international scale of all kinds of scientific investigations carried out with space vehicles, rockets and balloons. COSPAR's highest body is the Council, which is comprised of the Committee's President, Representatives from Member Institutions and International Scientific Unions, Chairs of the COSPAR Scientific Commissions, as well as the Chair of the Finance Committee. Conventionally, the COSPAR Council meets at the Committee's biennial Scientific Assembly.